Hi, I am interested in your 1986 Chevrolet C/K Truck 2WD Regular Cab 1500 (stock #4720-ATL) listed on Autotrader for $24,995. I'd like to get more information about this vehicle and confirm its availability. 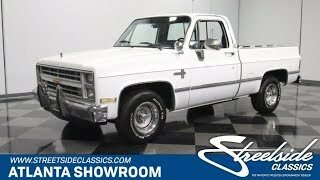 There arent all that many pickups that have braved more than three decades of service better than this 1986 Chevrolet C10. Running with gusto and ready for action, it still features its original powerplant underneath the hood, along with the very same interior it began life with thats still looking sharp and chock full of classic mojo. The exterior remains almost entirely in factory configuration and a freshening of its paint has injected vitality youll notice right away. The respray was done well, providing this vintage Chevy with a nice shine that really comes alive in the sunlight, though a comprehensive detailing would take things to an even higher level. Stout and square, with a pair of push bars and fog lights taking center stage on its front bumper, its a very capable looking truck. A diamond plate bumper takes the place of the original in back and, as you take a lap around you cant help but be impressed with the exterior alignment - both the body contours and chrome trim running the lengths of the sides line up really well as they transition from front fender to door to rear bed area. Clear glass surrounds the cabin, the sliding rear windshield opens and closes just as smoothly as intended and the badging on all four sides is very much on point. Inside, youll find the same blue interior that this pickup rolled off the lot with more than 30 years ago. It presents impressively - most would consider it to be plenty clean for a truck with a decade of service under its belt, let alone one with more than three times that. The cloth bench seat shows no major signs of wear and still retains plenty of comfortable padding - factor in this Chevys strong running condition and youll have no qualms embarking on road trips behind the wheel. The original steering wheel still sits on the tilt column, while just beyond it, the dash area is looking very clean, with clear functional gauges in its instrument cluster and an AM/FM/Cassette deck on board to provide an era-appropriate audio experience. Additional comfort and convenience features include air conditioning thats blowing cold and strong, power door locks and windows and cruise control. In back, the bed liner is also in very strong condition, showing only a few very minor scuffs - badges of honor for a workhorse like this. Raise the hood and youll find a collection of fresh-looking hoses and belts to back up the notion that this truck has been well-cared for. In their midst sits a 305 cubic inch V8, wearing a jet black Edelbrock air cleaner over an upgraded 4-barrel carb with electronic choke and still running in top form. The engine pairs with a smooth-shifting 3-speed automatic thatll take just a little bit of the dread out of stop and go traffic and, with a 2-1/2 exhaust running all the way to the back, a nice rich note comes out of the tailpipes. Power brakes that feature discs up front provide low-effort, fade-resistant stopping power, while power steering makes navigation easy. This classic pickup rolls on a set of 15 Rally-style wheels with spinner centers that have been wrapped with BF Goodrich T/A radials. Whether you opt to make it a regular fixture at your work site or to enlist its abilities for your weekend warrior pursuits, this 1986 Chevrolet C10 is very much up to the challenge. Call today!